Algerian club JS Kabylie have been banned from playing at home for the 2014-2015 season following the death of Cameroonian Albert Ebosse last month. Fans of Kabylie are also banned from attending any matches - home and away - until the start of the year. 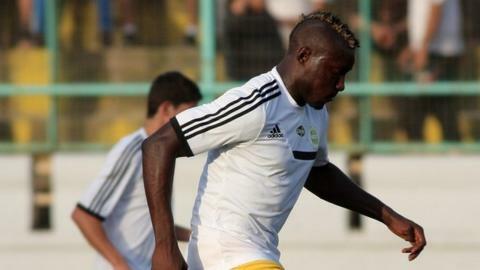 Ebosse died after he was hit by a missile on 23 August following JS Kabylie's 2-1 loss to USM Alger in a league match. The sanctions have been handed down by Algeria's Professional Football League. No longer able to play at their stadium in Tizi Ouzou, Kabylie will play their designated home matches behind closed doors at a neutral ground until the end of February. Supporters will only be allowed to travel to away matches in January. League football resumes in Algeria on Friday evening for the first time since Ebosse's death with the third round of matches, with Kabylie playing on Saturday at USM Bel Abbes. In a separate meeting, Algeria's FA met with Professional Football League officials to discuss the increasing violence in stadiums. "(Both bodies) decided by mutual agreement to intensify the fight against this scourge to eradicate it from our sports arenas," the FA said in a statement. "The Federal Bureau (of the FA) decided to increase sanctions for missile throwing, use of pyrotechnics and laser, as well as other disorder in stadiums," the FA added. The organisation also renewed its condolences to Ebosse's family, Kabylie and Cameroon sport, while stressing its commitment to monitoring compensation for the late player's family.